So I mentioned in this month’s goal post that I wanted to learn how to wear makeup. I never wore makeup daily before, mostly because I am too lazy. But now I’ve decided that I really want to look like a grown up and wearing make up is part of that process! I obviously need to adopt a routine that is quick, natural looking, and effective. 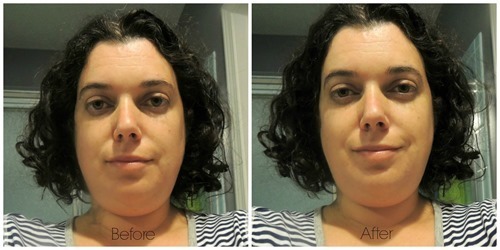 I’m starting with the basics here – and when I got Olay Fresh Effects BB Cream in my most recent Influenster Vox Box, I decided to use it as a base and foundation for my makeup. This picture shows me before I put on the cream, as well as after. To be honest, there is not much of a noticeable difference, likely because the tinting in the product is very light. This is ok with me, because I don’t want my face to become too tan or unnatural looking when I apply the cream. I then have the option of following up with a bronzer and / or blush. I really like the feel of this cream. It is not heavy at all and is easy to apply smoothly. I also like that it has UV protection built in. I am happy to use this cream as the base level to my new makeup routine. Olay Fresh Effects BB Cream can be purchased at www.olayfresheffects.com and http://www.amazon.com. I received this product to review from influenster. I did not receive any other compensation for writing this post. All opinions in this post are my own. Have you tried this product? Let me know what you think!